In layman’s terms, some see the debate over the “mismatch effect” as another form of the argument over whether getting a gentleman’s C at Harvard is better for one’s future than getting straight A’s at a lower-ranked university. In an awkward exchange in Wednesday’s potentially game-changing Supreme Court arguments on affirmative action, Justice Antonin Scalia hesitantly asked whether it might be better for black students to go to “a slower-track school where they do well” than to go to a highly selective college, such as the University of Texas, through some form of racial preference. “I — I don’t think it — it — it stands to reason that it’s a good thing for the University of Texas to admit as many blacks as possible,” Scalia said, challenging Gregory Garre, the lawyer defending the University of Texas at Austin’s affirmative-action policy, which supplements the automatic admission of top-ranking students from all public high schools across the state with the use of race as one factor in a “holistic” approach to admissions. In asking such a question, Scalia was stepping into a long debate over what has been called the mismatch theory of college admissions. 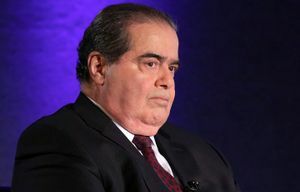 Justice Antonin Scalia’s comments came during arguments in a case involving a race-conscious application system at the University of Texas that was challenged by Abigail Fisher, a white woman who says she was the victim of reverse discrimination. A ruling could determine whether Texas’ flagship university can continue an admissions policy that takes race partially into account for about a quarter of its student body. Fisher says she was denied an equal shot when she was refused admission in 2008. She has since graduated from Louisiana State University. The proponents of the “mismatch effect” say that large racial preferences are harmful to those who receive them, that they learn less than they would if they attended a college more closely matched to their level of academic preparation, receive lower grades and become academically discouraged and socially segregated. Critics say the “mismatch” research is based on flawed assumptions that cannot be validated by other researchers and that the evidence is more likely to show that all students, regardless of race, benefit from enrolling at the most challenging college that will accept them. In the current Supreme Court case involving the University of Texas — which could reshape the use of affirmative action in college admissions nationwide — the “mismatch” theory has been well-briefed on both sides, although it is not a central argument of either side. In layman’s terms, some see it as another form of the argument over whether getting a gentleman’s C at Harvard is better for one’s future than getting straight A’s at a lower-ranked university. “There’s research finding that roughly half of government leaders and half of corporate leaders come from just 12 selective colleges,” Richard Kahlenberg, a senior fellow at the Century Foundation who has studied affirmative action but favors a class-based admissions process, said Thursday. “So clearly we want to try to find ways to provide access to those institutions for people from a variety of backgrounds,” he said. Some activists said Scalia seemed to be going beyond the mismatch argument to suggest that African-American students could not compete at top colleges. After his initial comment, Scalia said that “maybe” the university “ought to have fewer” blacks. “I think Scalia’s comments were both unfortunate and misguided,” said Rachel Kleinman, senior counsel for the NAACP Legal Defense and Educational Fund, which submitted an amicus brief in support of the university on behalf of its Black Student Alliance. While he was not explicit about what colleges produced the black scientists he was talking about, “A lot of the places they do come from are historically black colleges and universities,” Kleinman said. Scalia’s comments drew a sharp response from Garre, the university’s lawyer. He said students who are admitted using their race as one of many criteria “fare better” academically over time than those admitted from the top 10 percent of every high-school class, without regard to race. Stuart Taylor Jr., a Princeton University graduate, lawyer and writer who co-wrote the 2012 book “Mismatch: How Affirmative Action Hurts Students It’s Intended to Help, and Why Universities Won’t Admit It,” said Scalia’s lack of eloquence had made what he said sound worse than it was. In the current case, Taylor is counsel on an amicus brief propounding the mismatch theory, on behalf of his co-author on that book, Richard Sander, a professor at the UCLA law school. “Students who are admitted with far lower grades and test scores and other indicia of academic capability are almost certain to do badly academically, and we think, and this is more debatable, that they’re also likely to do worse in their careers and other departments of life than they would if they were getting good grades at some less prestigious school,” Taylor said. He said the idea was not to reduce the number of black students going to college but to admit them to schools where they would be more likely to succeed. Christle Nwora, 21, a senior at the University of Texas and a member of its Black Student Alliance, was admitted because she was in the top 10 percent of students at Plano East Senior High School. She is a humanities major and in a program that will send her to medical school in the fall. She said prestige had been a factor in her decision to go there.